The AC Horn Manufacturing Smooth-Flo Chute enables your operation to decrease broken product and improve product appearance. The unique design of the patented Smooth-Flo Chute offers useful applications for gentle product handling especially when space is limited. Originally developed to overcome problems inherent in standard commercial spiral chutes, its simple and sanitary design makes it the “product of choice” in difficult environments in the food and pharmaceutical industries. Other spirals may look the same, but each one is made to customer specification. 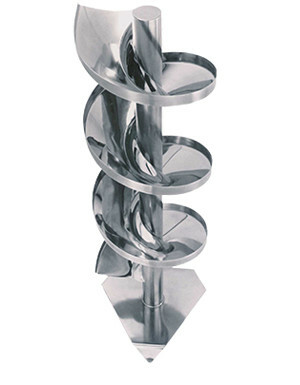 The design of each spiral chute is based upon product specification. The Smooth-Flo Chute, manufactured exclusively by Horn, has no cross seams or ridges to impede product flow. The constant velocity design ensures that the product acceleration is controlled, virtually eliminating product degradation at decline and transfer. Our spirals are designed for first-in/first-out product flow, ensuring a high-quality appearance and maximum customer satisfaction. Our spiral chutes are custom designed to your dimensional targets, unique product flow characteristics and special process requirements.